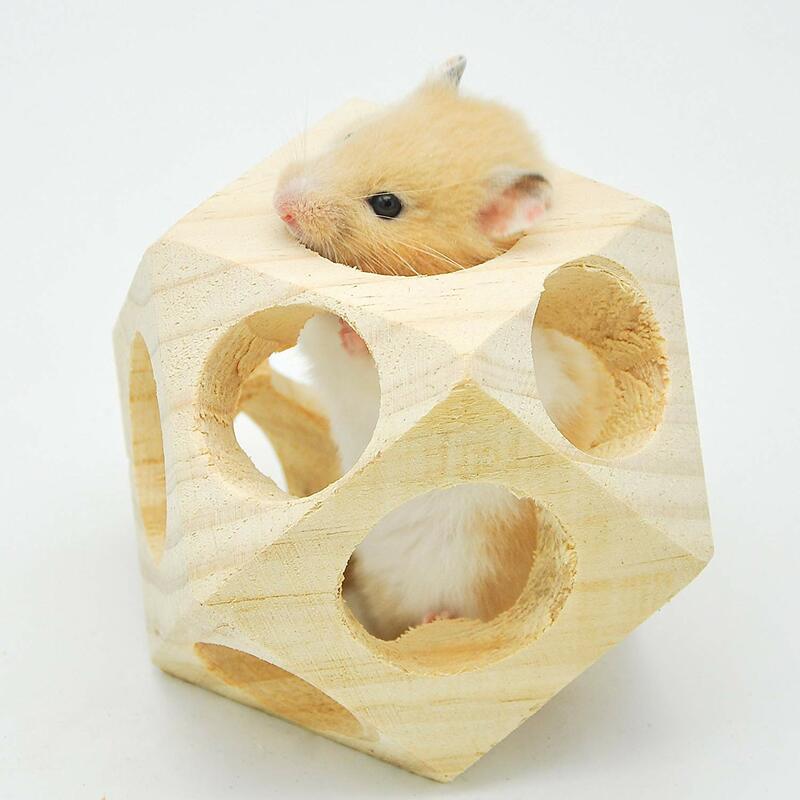 Dwarf hamster cages come in all shapes and sizes but how do you know which one to buy… You don’t. If you’re like me, a bargain hunter then you have probably considered buying a dwarf hamster cage without knowing whether it will benefit you, save you money (in the future) and if it’s easy to maintain/clean. 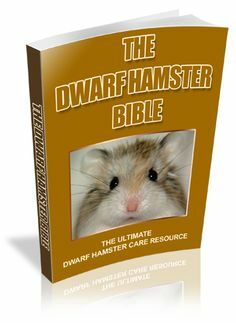 I am going to help you decide on the buying a dwarf hamster cage that will save you money and time. Buying a Cage or an Aquarium? Believe it or not, Aquariums for dwarf hamsters are better than cages. Aquariums are glass tanks that can be used as a hamster home and provide a great 360 view and more space for your hamster to run, play and hide. Although they are roughly the same price but sometimes more they will benefit you greatly with time & money. The price for an aquarium for all types of dwarf hamsters is around $70-85 with free delivery (you do not want to have to carry that home, it’s easier delivered) and this one meets the recommended cage size, click Here to see more reviews. An aquarium also stops biting of the bars which saves you money in the future buying a cage without bars. 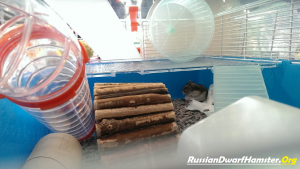 Having more than one dwarf hamster is popular with Russian dwarf hamsters as they are one of the only species of hamster to live in a pair, under certain circumstances. Keeping two together is still risky as they may become enemies when kept together in a cage that does not provide enough room. 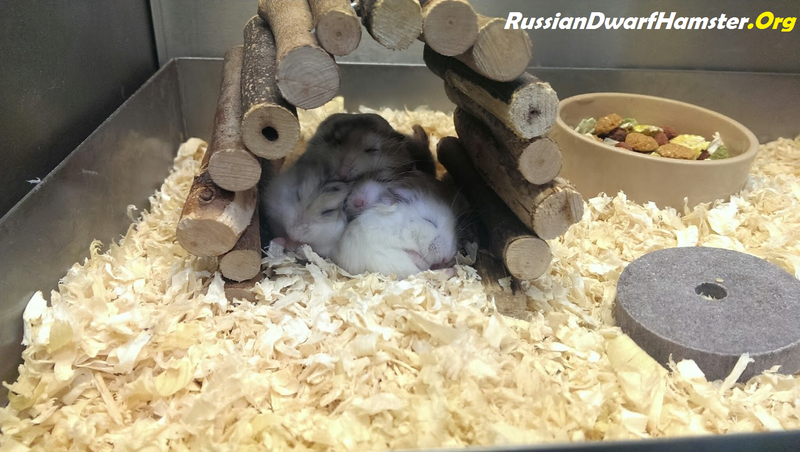 Paired Russian dwarf hamsters need plenty of room to avoid future fighting, territorial behaviour and possible severe injury. It is recommended to keep two dwarf hamsters together within an aquarium that is at least 20+ gallons in size. This will provide enough space for our Top 10 accessories they LOVE. Here is a good tank that I have and still use to this day that can hold two dwarf hamsters. It can be bought for the same price as our most recommended dwarf hamster CAGE called the Ferplast Duna. Choosing the right environment for your hamster is very important. A spacious cage/tank will ensure a happy hamster life and will save you time, effort and money cleaning out. Large dwarf hamster cages like the Ferplast Duna cage are great cages however they do take about 10-30 minutes to clean out, prepare and put back together. This after a couple of months becomes something you do not look forward to doing. Aquariums are easy to clean, eliminate bar chewing and provide a safe reliable and escape proof environment. Aquariums/Tanks can be filled with toys, saw dust and tubes to create a really fun hamster home. There is a reason why pets stores use tanks and that is because they provide plenty of space, see through glass and they are easy to maintain/clean. We recommend you check out this 20 gallon tank for reptiles, hamsters and more. It is only $64.95 for the next 24 hours. Click here to see more reviews of this cage. 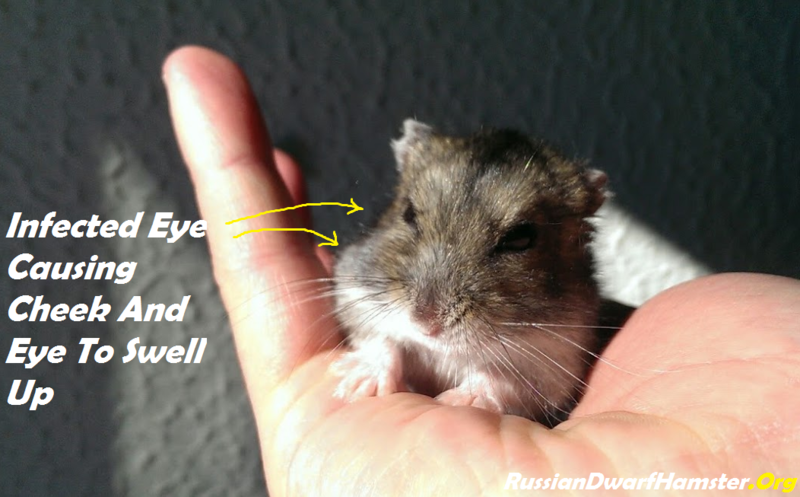 When a Russian Dwarf Hamster has eye problems it can be very upsetting to see. Especially if they are struggling to see. Old age is the most common reason for eye problems and sticky eye forming. Infections – Infections can happen at any time and need to helped earlier than later. Eye infections and cheek infections can cause pain, weight loss and death. It is always advised that you take your hamster to the vet if you think an infection is present. 2. Sticky Eye – This is a condition that happens when something gets within the eye. After a while it will become “gewy” and sticky. Hence the name sticky eye. It is very common with old age and hard to treat. 3. 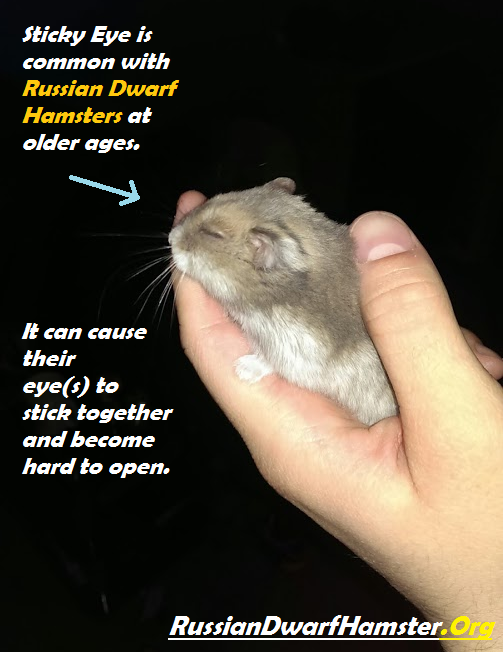 Old age – When a hamster grows older (1, 2 or 3 years of age) they are more prone to infections, sticky eye & much more. This is normal with age. If your worried about your hamster then you should take them to the vet. The vet will be able to tell you if there is a problem. Generally problems like infections swell up (like a balloon) and a can be easy to notice. Vets and medical animal doctors will give you treatments and helpful advice on your individual problem. Do not leave it to late if your hamster is becoming bony, weak and sleeping more than often. Do you have a problem with your hamster and looking for some advice, help or tips online? Leave a Comment Below. When a hamster bites the bars on its cage it is a sign of boredom, wanting to escape or a problem. I would be lying to you if I said that not every hamster bites the bars on their cage. Although this is normal behaviour, it is very annoying to be woken up by your hamster biting the bars. Today I am going to show you how to stop your hamster biting the bars. Extra toys, accessories and chewies – These will help keep you hamster occupied and prevent them chewing bars. See our top 10 Accessories they LOVE. Handling them more – If your hamster is bored then handling them more than once a day can help. However if they start biting the bars (within the first 10 minutes back in the cage) then the next point is what you need to do. A glass aquarium instead – This is your best option because it eliminates any chewing of bars completely. Many people prefer this compared to cages as they are easier to clean, maintain and last much longer. Here is a recommended aquarium that has no bars (and is good size, value for money). Hamsters enjoy chewing on everything and once you have a aquarium it is recommended that you give them chew able treats to help keep their teeth in shape. Did you know that a hamsters teeth never stop growing? An aquarium is a much better option then buying a different cage. Pet stores recommend aquariums over cages because they are more accessible provide more space and will give your hamster a better life.